When you drink from a tap in Israel, chances are that you are taking a mouthful of the Mediterranean. As I explained in my last water-themed post, around 60 per cent of Israel is desert and the rest of it is pretty dry too. The Dead Sea on the east border of the country is an incredibly salty body of water known for its mineral properties and coastline resorts. But it is to the west, the Mediterranean, that Israel has looked for water to quench its parched landscape and thirsty populace. There are four major water desalination plants on the coast of Israel, with a fifth about to become operational. When it is finished, the production capacity of all of Israel’s desalination plants will reach 600 million cubic meters of water – which is nearly 70 percent of Israel’s domestic water consumption. According to a government decision, by 2020 the desalination plants should reach a capacity of 750 million cubic meters. Israel has had a roasting summer and recent winters have been relatively dry. But that is no longer an existential worry due to the massive investment in these desalination plants. However, the country can’t just rely on piping water from the coast all over the country. Major efforts are underway to desalinate water from saline groundwater sources and to recycle water from municipal waste water plants. 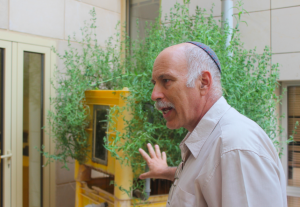 When I was in the Negev Desert, I visited Professor Jack Gilron, a desalination expert at Ben-Gurion University’s Institute for Water Research. Professor Gilron is one of the country’s foremost experts on water desalination and remediation. At a pilot plant in the Negev, Professor Gilron and colleagues test methods of desalinating water using tiny vein-like membranes through which salt water is forced at high pressure. A thermodynamic process removes the salt and the technology is sturdy – the membranes in operation in Israel’s desalination plants typically last up to seven years. 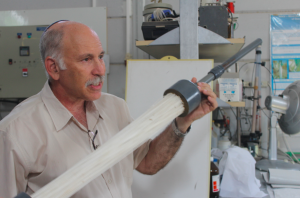 The team in the Negev are also developing desalination to suit the needs of those farmers in dry regions that are far from the coast and therefore expensive to reach with desalinated water piped from the coast. Around 10 per cent of Israel’s energy usage goes towards powering those desalination plants which also adds to the cost of water. 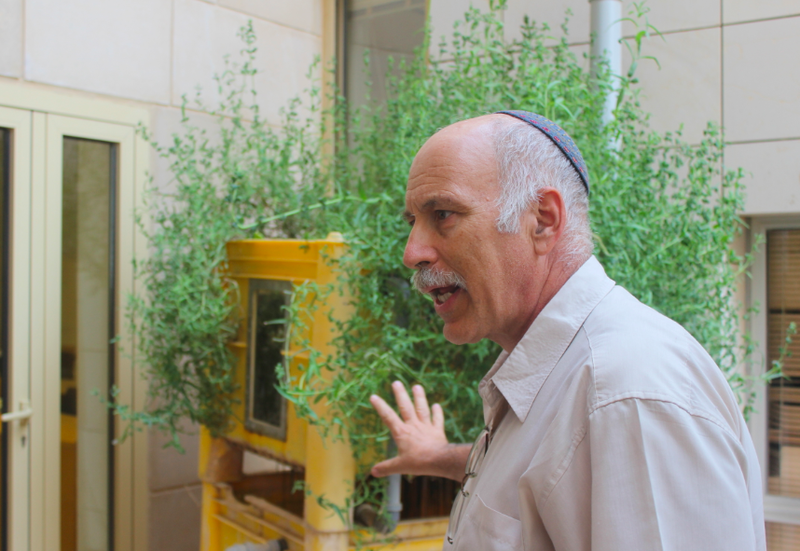 Like the Negev farmers I visited who are growing olives and other crops irrigated by saline groundwater sources, Professor Gilron also sees huge potential to recycle water from cities and towns for use in agriculture and secondary usage for cleaning and watering gardens. In a courtyard of the water research institute is a trial device that brings that water recycling vision to the individual homes. The vertical wetland can be set up by a household to continuously clean domestic grey water fed into it. The main ongoing cost is powering a small pump, the type of which you would find in a fish tank. “It’s grey water recycled over a bed of rock which develops a biofilm that breaks down soaps and detergents. The water can then be used for flushing toilets or even irrigating crops. There is no risk from viruses or biological pathogens,” says Professor Gilron. In returning to the key question running through my time in Israel, I asked Professor Gilron whether cooperation with Israel’s Arab neighbours over water and technology to access and treat it, could be a bridgehead for peace efforts. He said it is already happening. According to the same article, Israel last year signed an agreement to construct a shared desalination plant in Jordan and sell additional water to the Palestinians. There’s growing potential then for a precious resource over which wars have been fought in the past, to unite wary neighbours.